Hello Everyone! It's Lindsay from the DT here with you today. 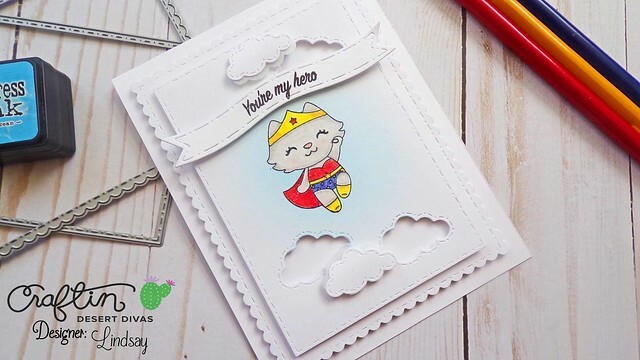 Today, I want to share with you a card that has quite a lot of dimension, something that is a bit unusual for me, but a lot of the dimension I've added with die cutting. 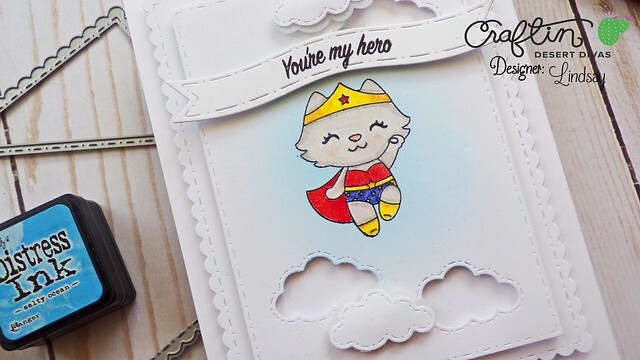 Be sure to watch the full video tutorial below to see how to add dimensional die cutting to your cards for more interest!! Starting with the larger plain stitched rectangle in the Fancy Frame Die Set and the cloud from the Scene Builder Die Set (this technique is one of those instances where the stitching on the outside of the die really comes in handy!) I cut three clouds into the white card stock rectangle die cut. I saved two of the clouds that I cut and also cut two more clouds from vellum card stock. Then, with my MISTI and Memento Tuxedo Black Ink, I stamped the WonderCat from the Caped Crusaders into the center of the rectangle. After quickly coloring in my WonderCat with my colored pencils and blending out with my Gamsol and blending stumps, I masked off the image and sponged on a light halo of Salty Ocean Distress Ink to highlight the image. Then it was time to start laying up all of the die cuts. Be sure to watch the full video tutorial above to see how I put together all of the dimension with the die cuts! 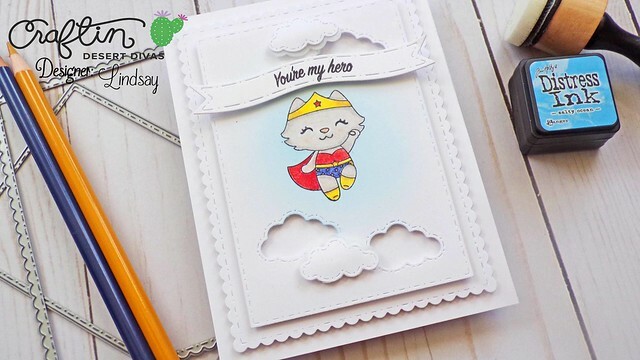 After all of the layers were put together, I added on a banner from the Flag Banner Die set, that I had stamped on the sentiment "You're My Hero" with black dye ink. This was a very white on white card, but with the added dimension, which adds shadows, it's not too overwhelming! I am loving the way this card turned out, even though it may be one that has to be hand delivered or extra postage added to it!! LOL!! If you re interested in any of the CDD Products I used on my card today, you will find them all linked below! Until next time, Happy Crafting!! So cute and so so fun!